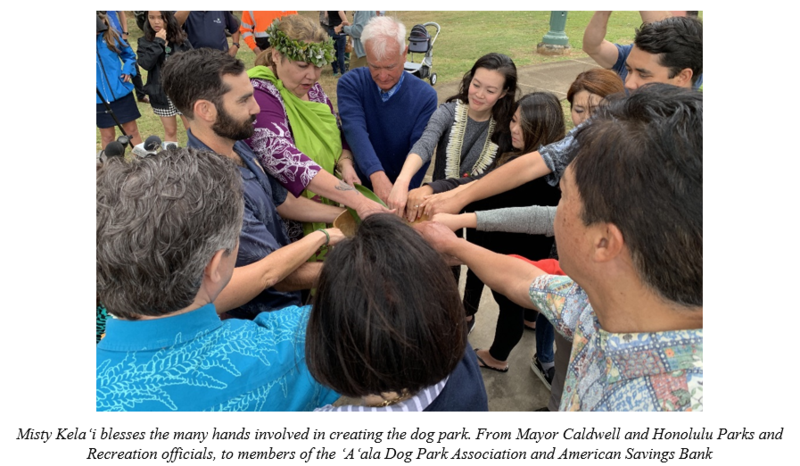 HONOLULU – The latest off-leash dog park is now open on O‘ahu after Mayor Kirk Caldwell, Department of Parks and Recreation (DPR) Director Michele Nekota, and the Mayor’s Office of Culture and the Arts (MOCA) Executive Director Misty Kela‘i led a blessing ceremony today. Located at ‘A‘ala Park, the approximately 10,000 square foot off-leash dog park features sections for small and large dogs. The dog park was made possible through a public-private partnership between the city and the ‘A‘ala Dog Park Association, a non-profit organization. Fencing and concrete pads were gifted by the association at a cost of just over $40,000, while various city departments assisted in the design, landscaping, and permitting work. Reopened following a maintenance closure earlier this winter, ‘A‘ala Park recently experienced improvements to the grass fields, comfort station, play court, and play apparatus, many of which are part of the mayor’s Kākou for Parks initiative. This is the fifth off-leash dog park on O‘ahu managed by the Department of Parks and Recreation. For a list of the dog parks click here. The dog park hours will reflect the park closure hours, with the facility open from 6 a.m. to 9 p.m. daily.